I’m sorry. I know a lot of people wish that the marketing technology merry-go-round would slow down and consolidate. And I fully appreciate why that’s desirable. Unfortunately, the evidence I keep encountering says we’re not there yet. 1. Social Relationship Platforms (SRP). We’ve come a long way from simple social media monitoring. Social media marketing and management has become more complex, larger in scale, and more important than ever for brands to get right. Tackling that mission, many of the leading products in that space — such as Hootsuite, Percolate, Spredfast, and Sprinklr — have advanced tremendously over the past couple of years. I debated with Jeremy Epstein of Sprinklr a year or so ago whether they were offering a product or a platform. He insisted on the latter, but I remained skeptical. It didn’t feel like a platform to me the way I was thinking of the major “marketing clouds” that were being positioned as the core systems of record for marketing and developing ISV ecosystems. However, as Sprinklr has made an expansive set of acquisitions and combined them into an overarching architecture that they call an “Experience Cloud,” I have to admit, they’re looking more like a platform. (Memo to Sprinklr: ISV ecosystem.) It’s a very different kind of platform than those that emerged from the CRM, CMS, and marketing automation vendors. But when you look at how marketing is changing, it makes sense that there could — and should — be very different approaches. Jeff Dachis, an advisor to Sprinklr, published an article on TechCrunch Why Marketing Clouds Make No Sense, that outlines their vision of how these social relationship platforms could become the center of gravity for a brand’s marketing technology. Admittedly, the title is a bit click-baity, as for the visible future, SRPs won’t replace MAPs, CRMs, or CMSs. But they may be equal peers — and it’s quite possible that the SRPs could take the lead in being marketing’s primary coordination system. It’s not coincidental that Spinklr was just valued at over $1 billion (another unicorn!) in their latest fund-raising. Of course, the major marketing clouds themselves are also building or buying social marketing technology into their offerings. But the latest Forrester Wave report on Social Relationship Platforms concluded that the “point solutions” — their words, not mine, Jeremy — had beat out the suites. Percolate, Spredfast, and Sprinklr were all rated “leaders” while Adobe, Oracle, and Salesforce were merely “contenders.” A gulf of “strong performers” separated them. I found the above graph in Forrester’s report to be particularly interesting in this regard — that marketers using point solutions were happier with their features and functionality than those who had the suites. Is this a phenomenon that’s unique to SRPs? I suspect not. 2. Tag Management Evolves to a Data Supply Chain. Last summer, I wrote a post describing how some of the leading tag management vendors were innovating as a new kind of marketing middleware. That metamorphosis has only accelerated. Last week, I was at Tealium’s user conference — disclosure: I was a keynote speaker at the event — and I was fascinated by how much they’ve advanced their architecture and product portfolio to become a grand “data supply chain” of marketing data of all kinds. Just as the SRPs were built around a vision of social activity of all kinds as a first-class citizen of modern marketing’s core customer experience capabilities, this next generation of tag management is driven by the vision of heterogeneous data pipelining — of all kinds, from a multitude of sources — as a first-class citizen of modern marketing operations. Tealium now supports over 750 turnkey integrations with a massively diverse set of other marketing technologies across affiliate marketing, analytics, display advertising, search marketing, email, personalization, social media, and so on. Two things that I find particularly interesting here. First, Tealium is making a big deal about giving marketers ownership of their own data. With Tealium’s customer data platform, you can define where the data lives. They’ll host it for you if you want. But they’ve also made it easy for you to host it on other cloud-based infrastructure that you own (or rent) independently. That’s a powerful statement, in a world where marketers are becoming aware of how valuable their data is — and how dependent they are on some of their vendors for the control of it. I think this will be a disruptive issue in the years ahead. Second, as with SRPs, many of the major marketing clouds include their own tag management. But most of their tag management capabilities have not evolved very much in the past couple years — certainly not to the degree of the leading tag management “point solutions.” (I put that in quotes because, quite frankly, this data supply chain now looks a lot like a platform too — although again, a very different kind of platform from the marketing clouds.) Tag management used to be just a feature. It was built or acquired, and the box was checked. But outside of the suites, tag management has continued to morph into something else. 3. Account-Based Marketing Rising. Another category of marketing technologies that has been blossoming lately is software for account-based marketing, where a vendor targets very specific companies for their marketing and sales efforts. Now, account-based marketing isn’t particularly new — it’s a strategy that formally emerged in the 1990’s. But the wealth of data and programmatic targeting capabilities that are now available to support it are inspiring a new wave of innovation. Companies like Demandbase and Bizo (which was acquired by LinkedIn and synthesized into LinkedIn Business Solutions) were some of the martech pioneers to power account-based marketing practices. But a new generation of start-ups has recently appeared, including Engagio (founded by Jon Miller, previously a co-founder of Marketo) and Terminus (funded by one of the co-founders of Pardot). Here’s what’s particularly interesting about this. You can certainly use existing marketing clouds to do account-based marketing — but most of them weren’t designed with that as their primary use-case. Talking with some of these new start-ups, it’s fascinating to see how they’re designing their entire architecture around that mission. And that has big implications on their underlying data model and their user experience (UX). Will these products be a “feature” that adds on to existing marketing clouds? At first, yes. But could they grow into first-class citizen platforms of their own, especially for companies who predominately rely on account-based marketing? And if you consider the incredible evolution of social media monitoring and tag management, it would seem unwise to underestimate the potential for new marketing platform models. 4. Amazon Machine-Learning-as-a-Service. The last point on the curve that I came across these past couple of weeks was the announcement by Amazon that they are now offering a machine-learning-as-a-service API, as part of their growing smorgasbord of web services. You can almost hear the sound of a dozen predictive analytics vendors groaning. Hard not to read that and wonder, “Is Amazon a marketing technology vendor?” For more technically advanced marketing teams — I’m thinking of Tony Ralph’s ad operations group at Netflix — yes, services like this can be consumed directly. Data science teams working under marketing would also probably find this accessible. The new competitive advantage will be in how these machine learning capabilities are applied. That will be the real value proposition for marketing predictive analytics companies. Their challenge is that, now, any entrepreneur with a better idea of how to apply machine learning power can create a working prototype with a fraction of the resources previously required. And it’s not just Amazon. For another example of the kind of API-accessible power that marketing technology teams can take advantage of on-demand, check out Diffbot, which could best be described as automated computer vision for the web. 5. Multi-sided Interactive Content. I can’t resist a nod to my last post on 2-sided interactive content — app-like content that includes a “buy-side” that prospects interact with and a “sell-side” that salespeople work with. I won’t rehash the whole post, but the conclusion at the end — that instead of just shipping data back-and-forth across the enterprise, we can pass adaptive experiences among multiple stakeholders, inside and outside of an organization — strikes me as the seed for another kind of marketing platform architecture. But I’m biased on this last one. If your head is spinning, you’re not alone. Mine is too. For marketers and marketing technology companies, this is an exciting yet challenging time. Marketers have the benefit of having thousands of the world’s smartest minds working on ways to give them superpowers that weren’t even imaginable a few years ago. But they wrestle with which technologies to adopt when, how, and in what combination. Marketing technology vendors have an amazing opportunity to shape this future — but face tremendous competition and continued disruptions to their carefully laid plans. The high-level advice I’d offer to both? Design for change. The evolution of marketing technology is not winding down. It’s heating up. Previous Post A 2-sided silver bullet for marketing and sales alignment? Thanks so much for the shout out and the comment. Always love how you contribute to the report. If you look closely at the Forrester report, you’ll notice two things. The first is an interesting use of the old Mark Twain “statistics” approach. 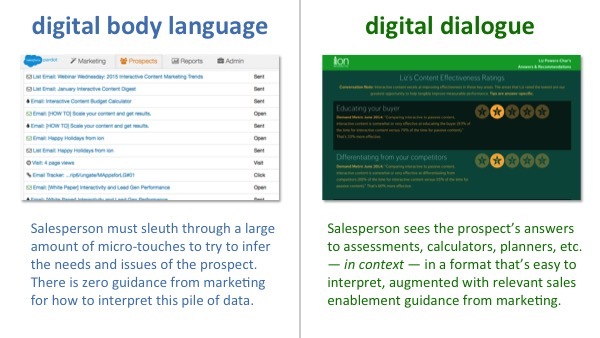 The second is a fundamentally differing worldview between Forrester and Sprinklr’s worldview. Let’s start with the worldview. The report clearly states a fact that “2/3rds of avid social marketers would like to buy their solution from a single vendor.” Yet, the report says that they are, in Forrester’s opinion, wrong. So, while most of the people actually DOING the work and looking for a solution want it one way, the opinion of Forrester is that they are misguided. Ok, that’s fine…certainly the prerogative of the analyst to do that, but it is just an opinion. We don’t think 2/3rds of marketers are wrong. We think they are right. VERY right and we think it’s risky to go the other way. If you really dig into the data, you’ll notice 2 things. Sprinklr received the highest possible score (5 out of 5) for customer satisfaction. So, if that’s the case, why are customers of single suites unsatisfied? What if you were to look at the actual data in the report and find out that the customers of SFDC and Adobe are VERY unsatisfied? Then, do the math…if you take 25 people and 8 of them give you a 5 and the other 17 give you a 1 or a 2…what is your average going to be? — the voice of the customer says they want to buy from a single vendor. They don’t want to spend their time being a systems integrator. –Sprinklr customers are the most satisfied as judged by their feedback. I’m not entirely sure if/where we disagree. I wonder if part of the challenge — not just in this post, but in the marketing world more broadly — is that the terms “clouds”, “suites”, “platforms”, and “point solutions” are incredibly ill-defined. They mean different things to different people. And very often, those different meanings are imbued with value judgements. For the exact same term, one person might consider it to be a GOOD thing, someone else might consider it to be a BAD thing. Language is a complex, funny thing that reveals a strange window into culture, psychology, and neuroscience — which is even more complex and funny. For all our excitement around algorithmic ways of predicting human thinking and behavior, it’s worth keeping a modest appreciation for the daily mysteries — many of which we’ve created ourselves — that we still have to unravel. Great stuff as always. Just one comment on machine learning as a service: the real differentiator among the predictive vendors is the data they assemble independently through their own spiders, publisher networks, and similar sources. Generic machine learning isn’t hard to find or reproduce. So Amazon and similar services won’t impact that market to any significant degree. On the other hand, if really good profiles were readily available, that would be a big problem for many of the specialists. Companies like Neustar (B2C) and Madison Logic Data/Bombora (B2B) are the ones to watch in that regard. Good point on keeping Amazon’s new service in perspective. These algorithms have been accessible to anyone who really wanted them for some time. Although my impression is that this packaging does significantly lower the barrier-to-entry for more products and developers to incorporate these capabilities. Your point about how existing predictive vendors already differentiate themselves — and it’s not the generic ML computing engines — is well-taken. Interesting thought on the advantages of the proprietary “spiders” though when you take a peek at something like Diffbot. The point I was trying to make, and I may have botched it by overreaching, is that the steady progress of open source and cloud-based API services is one of the sources of instability, er, innovation in the landscape. Another brilliant post! I agree I think Salesforce are not as strong as they used to be. I think many marketers now need to find a solution which delivers the right end result. I think with large platforms like Salesforce etc they are trying to do too many things at once and often user experience and most importantly functionality are not fully thought out. I agree 100% “design for a change” absolutely. I have scepticism about the strength of individual capabilities within marketing clouds. Particularly as many of these are being built through acquisition. It seems to me that post acquisition there can be a slowing in core product development as investment and focus shifts to integration (technical and cultural) and packaging. Perhaps a post for me to research in the future – “Marketing technology improvements pre and post acquisition”. Great observations on the state of the market(s) for marketing tech. I would add in this world of emerging/blending point solutions, suites, platforms, clouds, etc. that the buyers are wildly diverse. Some people want single vendor holistic solutions, others are steadfastly in the best of breed camp and there’s a lot of room in between. The market will remain like this for the foreseeable future because (to bastardize Tolstoy) while all companies do accounting the same way, they do marketing their own way. Ultimately vendors have to have a broad array of capabilities and provisioning models in order to expand their available market, otherwise they will get stuck in niches, and *massive understatement alert* there are a lot of niches. Also keep in mind the vendor scale issue. The landscape is an unweighted view – each vendor counts as one, but if you weight it by revenue there is a huge scale differential. Only the top tier vendors have the resources to acquire and integrate core capabilities into virtually seamless environments and even they will take several years to get this done. Although one vendor’s niche is another vendor’s kingdom? I agree that it’s likely that the multi-billion revenue vendors will all fit the model of acquiring/developing a broad array of capabilities — although there may be many different kinds of vendors in that category. But I am very interested to see how the market(s) below that threshold evolve. Scale and breadth of offerings certainly have advantages, but in a fast-moving world, they have less attractive characteristics too. I’ll be curious to see what the BAPs do when a new generation of specialists has outpaced their earlier acquisitions in a particular category (e.g., social relationship management). Will they invest significantly in reworking/expanding their current offering? Or will they acquire those next-gen leaders? If the latter, that will open up another set of questions about forking, merging, or deprecating one or the other. Agreed. There is a lot of room for all sorts of providers. Martech is probably the best example of an ecosystem ever produced in high tech. There are single celled life forms feeding off the heat vents at the bottom of the ocean while whales pass by overhead. It’s fascinating to observe and predict where the (r)evolutionary paths are for growth, how is the food chain is structured, how big is big, and what surprises may come from the murky depths to reshape the balance of power. Scott I would love to know your point of view on acquisition driven patchy product portfolio that various companies are building in marketing technology landscape. I understand that it might be a way to grow inorganically and go for IPO for some companies but how does it help brands? As the experience if quiet patchy when it comes to execution.